c. 1300, Messias, from Late Latin Messias, from Greek Messias, from Aramaic meshiha and Hebrew mashiah “the anointed” (of the Lord), from mashah “anoint.” This is the word rendered in Septuagint as Greek Khristos (see Christ). In Old Testament prophetic writing, it was used of an expected deliverer of the Jewish nation. The modern English form represents an attempt to make the word look more Hebrew, and dates from the Geneva Bible (1560). Transferred sense of “an expected liberator or savior of a captive people” is attested from 1660s. This sacred oil is secreted monthly by the claustrum. 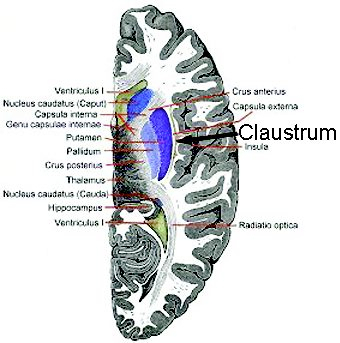 The claustrum is a structure located in the center of the cerebrum.